Wield true power in V4.1. Wield true power in V4.1... Starting Tuesday, May 8th, you will be able to become Thanos in the Infinity Gauntlet Limited Time Mashup. Experience Fortnite x Avengers like never before in this limited time event! Even a horde of husks don’t stand a chance against HackSAW! Best used when stationary, aiming down the sights, and firing in short bursts. Ability 1 - A mighty punch that knocks enemies back and destroys structures. Ability 2 - Thanos flies towards the ground, hitting an area for knockback and damage. Ability 3 - Harness the energy of the Power stone to fire a blast that deals damage over time. Ability 4 - A super-jump that can vault Thanos over all but the largest obstructions. Thanos doesn't take fall damage. Lowered the volume of Hop Rocks 🔈. Lowered the volume of the Valor Glider 🔈. Fixed an issue where the 'Allow Background Audio' setting wouldn’t save. Emotes now perform better on different characters (hands will connect, legs won't be over-extended, etc.). HackSAW is now in the Weekly Store (available Wednesday, May 9 at 8pm ET). 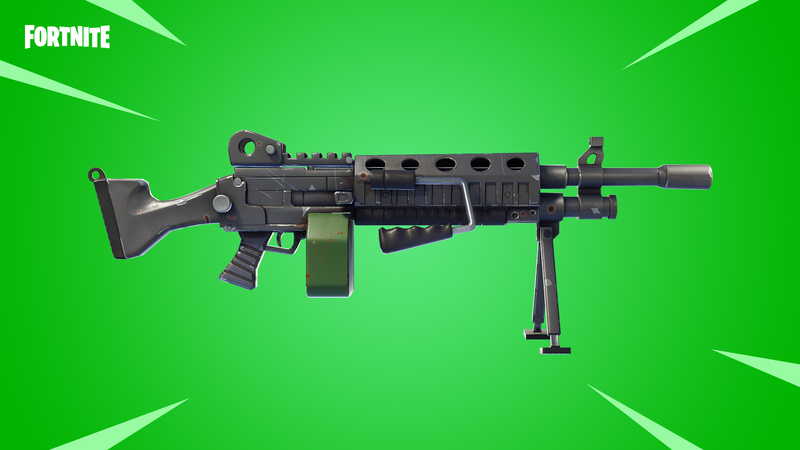 A light machine gun variant with a moderate rate of fire, mild recoil, a long reload time, and excellent ammo efficiency. Fixed an issue where ‘Shadow Stance’ was not being triggered by ‘Throwing Stars’ or ‘Dragon Slash’ damage. Fixed a tooltip issue with ‘Lefty and Righty’ on the abilities tab menu. ‘Dragon Slash’ should no longer consume Energy when being cancelled by switching weapons. Storm Chests and Salvage the Drone missions no longer grant an item cache. These missions cannot drop functional item caches but would appear to drop one that could not be redeemed. Fixed an issue that caused players to be unable to increase Hero rarity while using controllers. Fixed a spelling error in the description for Canny Valley Storm Shield Defense 10. Increased the frost look of Husks which have been damaged by an ice weapon, to better differentiate them from Husks which are Ice Elemental based. Lowered the brightness of the glowing elements on Neon Glow weapons. Fixed an issue that kept crosshairs of Neon Glow and VinderTech Sniper Rifles from rendering at low resolution settings. Fixed an issue where water splashes caused by a Rocket Launcher faced the incorrect direction.